Waitrose is eyeing up Stoke Newington as a possible location for a new store. The announcement comes just weeks after Hackney Council angered campaigners by giving the go-ahead for a new Sainsbury’s store to open in Stoke Newington. Jane Holgate from pressure group Stokey Local, which fought a widely publicised battle against the Sainsbury’s plans, said the group currently had no stance on whether a Waitrose store in the area would be a positive move. But she added that she expected campaigners would come out against any such scheme. Ms Holgate said: “We haven’t got a view at moment because we have to talk to our members, but I imagine it will be the same as our view on the Sainsbury’s. 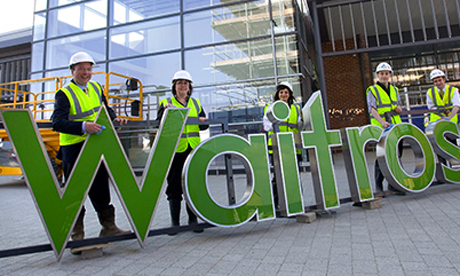 “Waitrose is one of the big five supermarkets. “The reasons people had for being opposed to the Sainsbury’s plans would be the same as the reasons for being opposed a Waitrose – such as the detrimental effect on small businesses and changes to the character of the area. Stokey Local is currently working towards fighting for a judicial review that could overturn the council’s Sainsbury’s decision if judges were to find the Town Hall’s decision making process was flawed. Hackney Council’s planning subcommittee chair Vincent Stops has defended the decision, saying it was taken in line with planning regulations. The plans for the new Sainsbury’s development in Wilmer Place – a scheme that will also include the creation of new homes – was put forward by developers Newmark Properties, which maintains the store will bring benefits to Stoke Newington.